The owner of the 47-story Waldorf Astoria New York may be planning to convert about 1,000 hotel rooms at the landmarked property into luxury condos, according to several sources. China-based Anbang Insurance Group purchased the hotel, located at 301 Park Ave., for $1.95 billion in late 2014. After the transaction closed months later, the firm's chairman, Wu Xiaohui,alluded to conversion plans for the structure's two towers without delving into specifics. According to sources, Anbang's vision is now coming into focus. Out of the hotel's nearly 1,400 hotel rooms, the company may be gearing up to covert about 1,000 of them into luxury condos. A conversion of that scale would be consistent with a filing Anbang submitted to the city in early 2015, when it subdivided the building into different sections for condos, a hotel and retail. Anbang set aside 1.2 million square feet—approximately 75% of the building—for residential use, according to the document filed with the city's Department of Finance, though it did not specify how much space would be used for amenities or for hotel ballrooms. A spokesman for Anbang said the filing was made over a year ago as part of the purchase process, and didn't actually reflect what would be done with the site. "We continue to explore all options, and no definitive plans have been finalized at this time," the spokesman said in a statement. 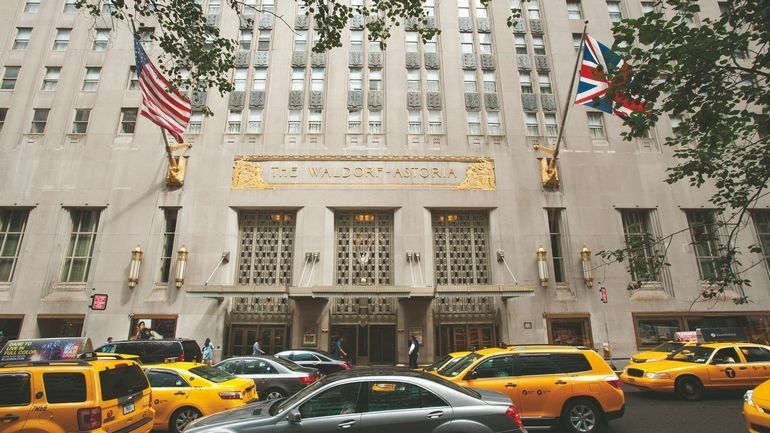 Currently, the Waldorf is split into two sections: the 1,232-room hotel itself and a 181-room boutique hotel called the Towers, which has its own entrance on East 50th Street and also features a number of one- and two-bedroom rentals. Earlier this year, the company filed separate permits with the city to gut the 12th and 24th floors. Anbang indicated that the demolition was part of an exploratory process to discover how a broader renovation might be carried out. But until that survey process is complete, the firm said it has no idea how much of the residential set-aside it will actually end up using. In order to convert hotel units into condos, Anbang would have to file plans with the state attorney general's office. Last year, the City Council passed a law banning hotels with more than 150 units from converting over 20% of the property into residences for two years without going through a lengthy city public review process. However, the legislation exempted recent transactions, including the Waldorf Astoria. Shortly after the legislation passed, Hilton Worldwide, which will continue to operate the hotel component, struck a deal with the Hotel and Motel Trade Council regarding severance pay for the service workers on site. Newer PostThis Home's Backyard Has Us Feeling Completely Relaxed — See It For Yourself!